Mothers and daughters share a special bond. There is something beautiful and unique about the Mother-Daughter relationship. What better way to celebrate it than with a fun Mother-Daughter retreat! This retreat can be modified to fit a wide range of ages, from young moms with small children to older moms with grown daughters. 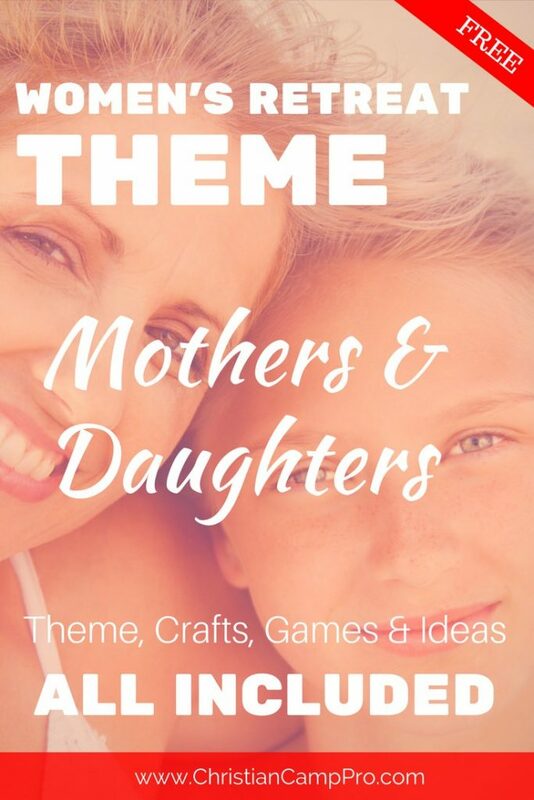 A Mother-Daughter retreat can bring moms and their girls together for fun and fellowship while strengthening their very special relationship. 3 In the same way, older women are to be reverent in behavior, not slanderers, not addicted to much wine. They are to teach what is good, 4 so they may encourage the young women to love their husbands and to love their children, 5 to be self-controlled, pure, homemakers, kind, and submissive to their husbands, so that God’s message will not be slandered. While it’s important for mothers to teach their children the basics in self-care, home-care, and other real-world skills, it’s even more important for moms to teach their children about God’s desire for their lives. Young girls should be encouraged to live godly lives and seek His pleasure rather than the accolades of society. It’s not always a popular idea for a woman to live in submission to her husband, but it’s important for mothers to teach their daughters that this is not meant to disparage females. This is meant as protection and a responsibility for males to lead the family in a way that benefits them and pleases God. 9 for they will be a garland of grace on your head and a gold chain around your neck. The teachings of a godly mother are of little use if her child refuses to listen and learn. A daughter who listens to the teachings of her mother and takes them to the heart becomes a wise woman. As she grows and matures, the wisdom she has gained by paying attention to her mother’s godly lessons will be evident to all who come in contact with her. 16 A gracious woman gains honor, but violent men gain only riches. According to this scripture, it is an honor for a woman to be gracious. A godly woman is wise, kind and hospitable. She is honest and trustworthy and conducts her household with wisdom and care. Other people may chase after worldly goods and fame, but a wise woman knows it’s better and more honoring to God to seek His will and follow His words. Everyone has a favorite family recipe for meatloaf, or banana cream cake or lasagna. This fun and easy craft is a great way to collect heirloom recipes and put them within easy reach. Instruct each attendee to bring copies of a cherished family recipe to share with the group. When all the recipes are collected they can be placed in a beautiful binder that can be customized by the ladies in attendance. You can also use plain wooden or tin boxes or even crates with colorful recipe cards for this craft. For this craft, simply supply your group with colorful beads, charms and stretchy string. Allow the mothers and daughters to work together to create a unique set of prayer bracelets that they can each wear. The bracelets aren’t just pretty, they serve to remind mothers and daughters to pray for one another. This fun craft is super customizable. You can go as simple or elaborate as you like! Provide each mother and daughter with a set of medium canvases and paints. You can all work from one design or each mother-daughter team can create their own. Just make sure that the duo paintings mirror and/or complement one another. For this game have all the mothers take off their shoes and place them in a mixed pile. The daughters make a second pile with their shoes. Line the daughters up across from the mothers’ shoe pile and the mothers up across from the daughters’ shoe pile. At the signal, the moms and daughters have to race down to the pile and find their mother’s or daughter’s shoes, put them on and race back. The first team to make it back wearing the correct shoes wins. If someone gets the wrong shoes, they must go back and start again! *This game is extra fun if you have younger girls and moms wearing heels. This game is played like the Newlywed Game. Each team must answer questions to see how well they really know each other. Mothers answer questions about daughters and daughters answer questions about their moms to earn points. The team with the most points at the end of the game wins. This is an extremely entertaining baby picture game! Ask each mother attending to bring along an old photograph of herself. It can be a childhood photo or just a good old throwback pic. Place the photos on a felt board or poster and give the daughters attending an opportunity to guess who the moms are. There will no doubt be lots of laughs as the attendees get a fun look at funky old fashions and crazy hairstyles of days-gone-by. It’s exactly what the name says. Have the mother-daughter teams dress alike if you wish. Employ some impartial judges to score the teams. Award a special prize to the mother and daughter who most closely resemble one another. Give small take-home prizes like goody bags to the other contestants. Moms spend a great deal of time looking after everyone else’s needs, so when it comes time for retreat refreshments, allow the moms to sit and the daughters to serve. It’s a small gesture of gratitude for a lifetime of care and love, but the mothers in attendance will be glad to be the ones being waited on for once. The mother-daughter relationship can be complex, complicated and at times, strained. But there is no other relationship quite like it. Mothers have a duty to teach their daughters the ways of godly wisdom and daughters have a responsibility to listen and heed their mothers’ teachings. A Mother-Daughter retreat can be a sweet way to celebrate the bond between moms and their daughters and to remind them of their duties to one another. Looking for a Fathers and Sons Retreat? We have that too! Special thanks to Lost Valley Retreat for making this article possible.